There are several different types of bulk food storage containers that you can use when storing your dry food and grain. We usually use the four, five, and six gallon buckets. You can buy smaller buckets if you have smaller items. Here are some benefits when using buckets. They're great when you have a lot of food to store. They keep the mice out of your food. This is especially important if you’re storing your grain and other bulk food storage items in a garage or barn. A plastic bucket protects your food from getting wet. If you take good care of your buckets and wash them, you can use them over and over again. Buckets are little more expensive up front, but in the long run, they can save you money. It’s easy to stack buckets on top of each other, saving you money on food storage shelving. Contact us if you would like to pick up some buckets. 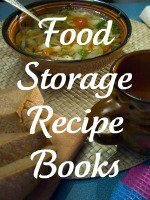 Bulk food storage containers can be kept right in your pantry. 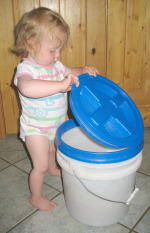 The plastic buckets are hard to open and seal each time you need to use them, so you can use a gamma lid. The outer ring stays on the bucket and the middle section easily screws on and off. Just keep refilling the gamma ring bucket when it's empty. See picture at the top of the page. 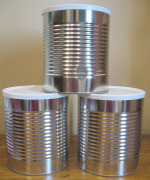 #10 cans are great bulk food storage containers. You can get them at the LDS cannery. They have all the needed equipment. 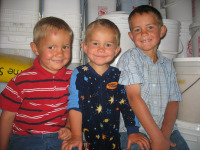 The cannery is a non-profit organization and has low prices on bulk food storage. Visitors Welcome. I love my #10 cans because they're small. I can set several of them on the shelf in my pantry. The #10 cans are sturdy and airtight. Your grain is kept safe from rodents and insects. Metal rusts when it gets wet, so you want to keep the cans out of the water. Mylar bags are less expensive than buckets and #10 cans. They are airtight and keep the insects out of the food. They aren’t as sturdy as the buckets and #10 cans and can be punctured easily. Mice will chew through a Mylar bag if you have a problem with mice in your storage area. They'll work great as a stand alone if you put them on the shelf in a protected area where the mice can’t get to them. You can put your food in Mylar bags, and then store the sealed Mylar bags in buckets. The Mylar bag acts as a second barrier. Over time, the oxygen and other gasses can travel through the pores in the plastic buckets. The Mylar bag is airtight. I don’t use Mylar bags inside my buckets, and haven’t had any problems with the grain, but it’s something to consider. Oxygen Absorbers take the oxygen out of the container so that the insects can’t survive. 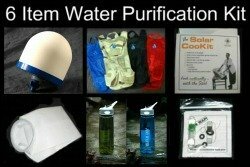 The 2,000 cc oxygen absorbers are used with the 5-gallon Mylar Bags. 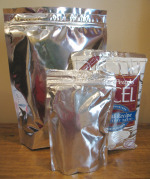 The 300 cc oxygen absorbers are used with the 1-gallon Mylar Bags or #10 cans. I don’t suggest using oxygen absorbers with plastic buckets because it decreases the pressure in the buckets. This causes the air to flow through the pores of the bucket at a faster rate. Dry Ice is a very economical way to fumigate your dry food before storing it in bulk food storage containers. Pour a little bit of grain, legumes, etc. into the bottom of your five-gallon bucket. This is so you don’t freeze and crack the bottom of your plastic bucket. Put one-quarter pound of dry ice in every five-gallon storage bucket. Then pour the rest of your dry food into the bucket. CAUTION: Dry ice will burn your hands, so use gloves when handling it. Put the lid on the bucket, but don’t completely seal the bucket. As the dry ice evaporates, the CO2 will start to replace the oxygen in the container. In about 3-4 hours come back and snap the lid on tight. Come back in a few more hours to check on the buckets. If they're bulging, burp the lid by kneeling on the center of the lid and pulling up on one side of the lid. Then make sure the lid is snapped back down into place. Without oxygen the bugs can’t live. Diatomaceous Earth is my favorite method to use. It takes more time and is a little more expensive. Seeds are living organisms and need air. If you take the air out of the bulk food storage containers, the seeds will eventually die. Instead of removing the air from the container, the D. Earth kills the insects without any harm to humans, plants, and animals. D. Earth is the fossilized remains of microscopic shells that are crushed into a powder. The D. Earth cuts up the insects skin. The insect dries up and dies. Thoroughly mix the D. Earth into the grain. Use 3/4 cup - 1 cup of D. Earth for every 5 gallon bucket. Wear gloves when working with D. Earth because it dries out your skin. Eating a tablespoon of D. Earth every day has positive health benefits for humans. If you’d like to learn more about Diatomaceous Earth and how it works, Earth Works Health has a lot of great information.